Infrared heating, new Grado technology. 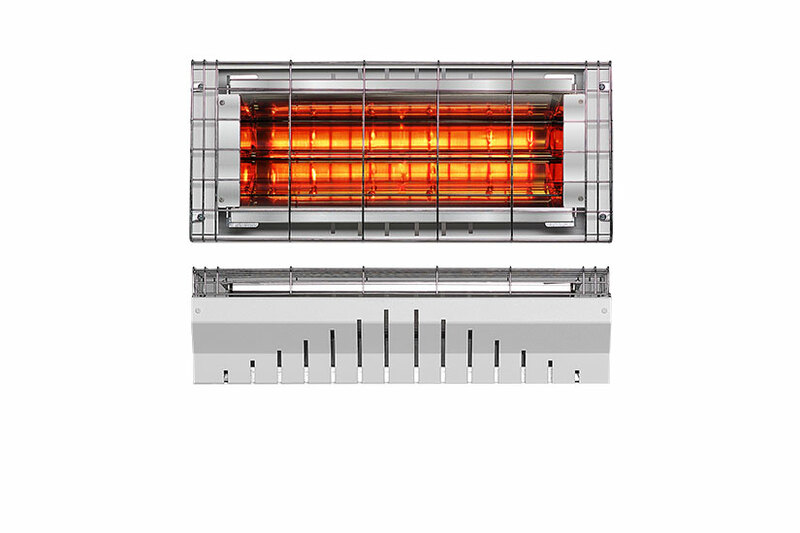 Special infrared heater equipped with an IRK lamp with a shortwave. Interchangeable one-piece reflector body. "SUPERMIRROR" aluminium reflector with a very high reflecting power. Halogen IR lamp custom-built with a fast shortwave, Teflon cable, and silicone glass fibre – reinforced body. Standard optic with a diffusing focal or a possible optic with a concentrating focal. Designed for internal use (churches, gyms, industrial premises, tensile structures, recreational spaces, etc.). Reccomended for discontinuous heating. Fully equipped with electric cord, lenght 3 m and Schuko plug (Mod. GHE ONLY). Embossed/smooth epoxy powder coating (suitable for outdoor use and scratchproof). Designed for internal use For churches, gyms, industrial premises, machine shops, workshops, tensile structures, sports Palaces, recreational spaces, warehouses, showrooms, passageways for railway stations, shopping centers, airports, indoor playgrounds, coffee shops, restaurants, dehors.